With an exceptional illustration cycle. 292 x 197 mm – 385 leaves, 81 historiated initials, and 59 decorated initials. Until the early or mid 13th century, the contents of Bibles varied considerably in different respects, including the choice and order of the biblical books etc. The rapid growth of the University of Paris as well as the emergence of the activities of Dominican and Franciscan preachers during that time, however, necessitated a standardized text of the Bible. Before it took its final shape by about 1230, a great number of these Bibles had been copied since c. 1200 – including the present manuscript – prefiguring that new version in an experimental phase. In cooperation with the theologian masters at the Paris schools, professional workshops provided the means for regulating and standardizing the Bible texts into a one volume version that later came to be known as the 'Paris Bible'. Our book with its exceptional and extensive illustration cycle represents a state of transition in the development of text and design, as well as in illumination and size. Each separate Bible book is opened by a superb historiated initial while the prologues usually begin with one or more ornamental initial, and some even with a historiated initial as well. The exceptional illustration in this manuscript is of minute elaborateness and can be compared with that in the famous Bible Moralisée (Vienna, ÖNB, Ms. 2554). Several hands were involved in the decoration of this manuscript; the difference between their styles, however, is hardly distinguishable. The hypothesis has been formulated that a number of excellent Paris illuminators from various workshops must have been assembled especially to execute that royal commission under the aegis of one main artist, whom is named the Master of Vienna 2554. Other illuminators executed work stylistically so close to each other that it would be hard to decide whether any two miniatures were made by two hands, or by the same individual on different days or campaigns. Together with the evidence of the layout and structure of the text itself, stylistic parallels help contextualize the illumination. Figures are elongated and elegant in outline, their gestures eloquent, although faces in general remain static. Most characteristic is the design of garments, folds and drapery. Cloaks and tunics have vivid and irregular hemlines, blue and red predominate the palette, while an unusual yellowish green is used for the clothes of minor characters. Typical for our painter(s), furthermore, are wide open eyes with pupils carefully picked out as black dots in all figures, relatively straight eyebrows, noses terminating in flourishes, quite uniform facial profiles, with low foreheads while ears almost always are hidden under curly grey or light brown hair accentuated with black lines. The small lips with red dots and red cheeks, however, are not specific but characterize all the workshops that were involved in illuminating the Parisian Bibles moralisées. The lush decoration of the book presupposes an important donor or a prestigious destination. 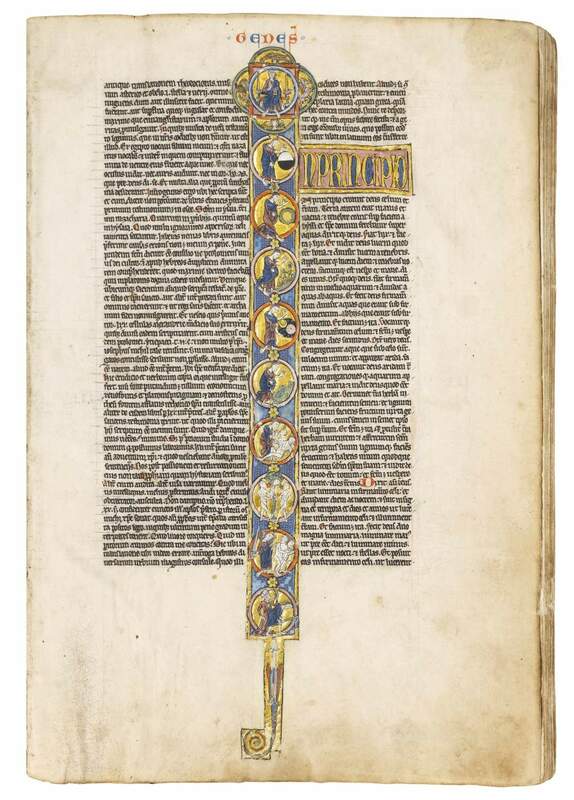 Jörn Günther currently has available a superb series of Bibles and Psalter Books of the first half of the 13th century that together could form the fundament of an extraordinary interesting collection.